With the governor of Washington declaring a state of emergency due to a measles outbreak, as well as other outbreaks reported in New York and Texas, the debate about vaccination is again at the forefront of national conversation. For parents, however, that topic recurs often. Thanks to boosters, immunizations such as the HPV and meningitis vaccines, and the annual flu shot, the decision whether to vaccinate or not is one parents must frequently answer, even for older children. 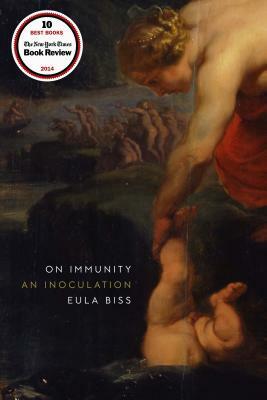 On Immunity: An Inoculation by Eula Biss examines that decision from a variety of perspectives—historical, philosophical, scientific, and personal. The book opens as the author walks along Lake Michigan in the early stages of labor, after which she details her son's delivery that was followed by a harrowing uterine inversion. That rare, potentially fatal complication required emergency surgery and a two-liter blood transfusion. Her husband later told her how the blood she lost on the delivery room floor made the sound of lapping waves when the nurses cleaned it up. She chronicles her experience of the traumatic event in vivid detail at various points throughout the book, including that she kept two glass liter jars of drinking water near her rocking chair in her son's nursery, which she says were her "only measure of what I had lost." Later, she recounts her interaction with medical professionals during that transfusion and the doctor's casual comment, "Remember, this is not your blood." Biss describes how the unforeseen, but necessary transfusion put her at risk for Hepatitis B, a vaccine-preventable disease. "I did not belong to a risk group at the moment he was born, but by the time I put him to my breast I had received a blood transfusion and my status had changed." She examines the psychological aftermath of her experience, including "the extreme fearfulness" she felt following her son's birth as well as how the experience was both "cold and brutal" but also "aglow with humanity." That dichotomy echoes the differing perspectives considered on immunization. Her perspective as a mother, and the evolution of opinion and belief that comes with the role, serves as a constant throughout the book. In a note at the end of the book, Biss explains that she writes specifically for mothers. I both appreciated it and found myself wishing that she had explained her view of her audience in the actual text, as I wondered as I read why she opted to use "mothers" when "parents" would have been both appropriate and more inclusive. In recognition of the debt my thinking owes to them, I have chosen, throughout this book, to use the word mothers in places where I could have used the words parents. I am writing to and from the women who complicated the subject of immunization for me. This does not mean that I believe immunization is exclusively of concern to women, but only that I want to address other mothers directly. In a culture that relishes pitting women against each other in "mommy wars," I feel compelled to leave some traces on the page of another kind of argument. This is a productive, necessary argument – an argument that does not reduce us, as the diminutive mommy implies, and that does not resemble war. The book is a mixture of maternal memoir and scientific research, and it is both readable yet dense. Biss illustrates how public health and immunizations are woven into our history—religious, political, literary— and our present-day lives. She deftly weaves together references to Søren Kierkegaard, Rachel Carson, and Voltaire's Candide. She made the works of such a wide variety of thinkers, most of whom I had not thought of in the context of vaccinations, so obviously relevant. She illustrates that, like the happy ending of Candide set in a garden, "[i]mmunity is a shared space—a garden we tend together." The ways in which she connects those complicated, sometimes conflicting, spheres in such an accessible manner make it easy to understand why On Immunity was one of the New York Times Book Review's 10 Best Books of 2014. While I appreciated Biss's skill in incorporating the thoughts of so many great thinkers, some of the passages that I found most enjoyable and interesting were the recounted conversations with her physician father. I found their father-daughter rapport, including their occasionally differing viewpoints, relatable, endearing, and educational. She describes how when she was a child and not feeling well, he would tenderly check the lymph nodes on the underside of her jaw and say, "I think you're going to be okay." When she had the flu in college, she called him for advice, which I think many of us did, regardless of our parents' medical experience. She found his advice less than satisfying though, explaining, "[H]e suggested, to my disappointment, drinking plenty of fluids." But then he went on to describe his grandmother's home remedy of buttered toast dipped in milk because he understood that what she really needed was comfort. When Biss calls him for advice about her toddler son, he tells his daughter that while he is a physician, he is not a pediatrician and she needs to find one she can trust. As I read that passage, I sat up a bit straighter and leaned in, as if receiving instructions from one of my elders. I confess that, as someone who has been an advocate for Shot@Life, a campaign of the UN Foundation that supports global childhood vaccine programs, I was dismayed to realize just how little I actually knew about vaccines. I was unaware that the term "vaccination" came from the Latin "vacca" for cow, as a callback to Edward Jenner's work using cowpox to inoculate against smallpox in 18th century England. That basic etymological failure on my part made me feel like my years of work on the topic were woefully inadequate. Towards the end of the book, however, I found a measure of comfort from Biss. She said that while she was overwhelmed by information, she noticed that "information itself is overwhelmed at times." Upon reflection, after giving her son a copy of Alice's Adventures in Wonderland, she found that Alice's experiences shared parallels with researching immunizations. She describes research as a rabbit hole and says, "I fell down it, in my investigation of immunization, and fell and fell, finding it was much deeper than I anticipated. Like Alice, I fell past shelves full of books, more than I could ever read." But read she did. Biss more than did her homework, as is evidenced not only in the text but in the 24 pages of notes and the 11-page list of selected sources, culled from what Biss says are "hundreds of newspaper articles, countless scholarly articles, dozens of books, many blog posts, some poems, several novels, one immunology textbook, a handful of transcripts, piles of magazines clipping and many essays." One common thread throughout my careers in law and journalism is that they involve large amounts of research. My love of facts runs deep, and research is near and dear to my heart. I greatly appreciate how well-sourced this book is. It also reminded me that while parents can and do evaluate scientific studies, it is interpersonal interactions that often have the most power to shape our perceptions. Dr. Paul Offit, MD, the Director of the Vaccine Education Center and an attending physician in the Division of Infectious Diseases at Children's Hospital of Philadelphia, as well as a vaccine inventor, tells Biss that after seeing children die from vaccine-preventable diseases, he finds it hard to respect a parent's choice not to vaccinate, but "[y]ou can respect the fear. The fear of vaccines is understandable." That passage transported me back to the moment when I was shown that respect. My daughter was two months old and she was about to receive her first vaccinations. I said nothing, but I was scared. Her pediatrician locked eyes with me and sought to allay my fear by saying in a kind voice, "I have seen children with these diseases. You are making a good choice." Some parents, however, make different choices. Biss recounts a conversation with moms who were raising their children to have "superior immune systems." She says that "building, boosting, and supplementing one's personal immune system is a kind of cultural obsession at the moment," and that some mothers believe their efforts "are a viable substitute for vaccination." For some, the belief stems from social Darwinism. Others believe that vaccination is only for those with a lower standard of living, while still others believe that immunity derived from natural exposure to disease is preferable. Biss doesn't detail the specific efforts of the mothers with whom she spoke, but she does address the chilling consequences. "When I asked a friend how she would feel if her child contracted an infectious disease and did not suffer from it but passed it to someone more vulnerable who would suffer, she looked at me in surprise. She had not, she told me, considered that possibility," she writes. "Vaccination is most dangerous, in many cases, for people with compromised immune systems," Biss writes. No one can explain the fear that accompanies that fact better than the parent of an immune-compromised child. I have several friends who have immune-compromised children as the result of cancer, organ transplant, or other disease that renders their body unable to handle immunizations. This is one of the few areas where I would have liked to have seen more detail from Biss. I think people would be surprised by the thousands of immune-compromised children and adults in this country who have no choice but to rely on herd immunity. The CDC explains that herd immunity, which is also called community immunity, is achieved when a sufficient portion of the population is immune to an infectious disease, its spread from person to person is unlikely, and thus those who have not been vaccinated still have a measure of protection from that disease. The majority protects the minority. Biss confirms that idea: "[t]hose of us with impaired immunity depend on people with more functional immune systems to carry immunity and protect us from disease." Herd immunity is one of the many ways in which we are all connected, a central theme of the book, and the word "inoculate" derives from the agricultural term for grafting trees—the root word means "to join or unite." Biss's exploration of the many ways we are all joined, including the "shared space" of immunity, and our interdependence on one another, is a compelling, thought-provoking read.